Award season may be ending, but spring, warm weather and major sales are here!! 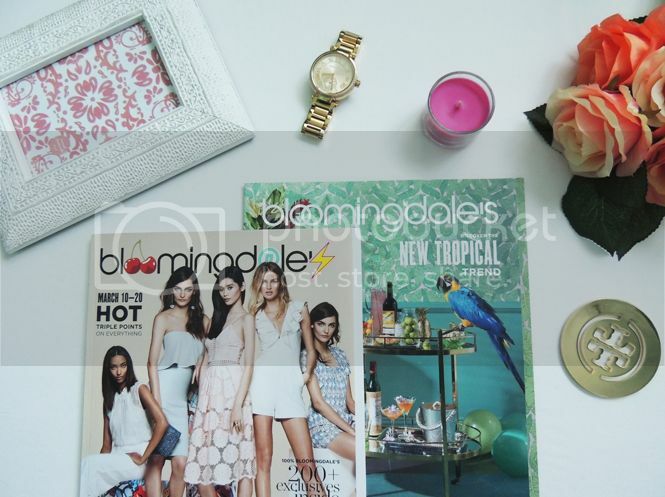 The Bloomingdale's Friends and Family has started and there are SO many great things you need to snag from this sale! Although some of my favorites like Tory Burch and Kate Spade are excluded, I've still found a couple of really great things to get ready for the warmer months. Especially with Mothers Day coming up, graduation season (hint hint to any family reading this! ;) and such, this is the perfect time to stock up on presents too! And lets be honest, even though some of the best brands aren't included in this sale, the element of surprise and happiness always sinks in when you realize something you're looking at is included in the sale! If you follow me on Instagram, you probably saw this picture of my Ray-Ban collection a few weeks ago; I can not get enough of Ray-Ban aviators! There are so many colors and styles to choose from and they're one of the many great things that are a part of this sale. I'm really eyeing this pair (seen above) because of the gorgeous, subtle color. I'm especially loving this cute cat eye pair that look like the Dior cat eye sunnies too! They come in so many colors and with 25% off they're such a steal. Clearly, I still can't get enough of the tassel trend! It's been a year since I really started loving tassels but they're still so in style and I'm seeing them everywhere. 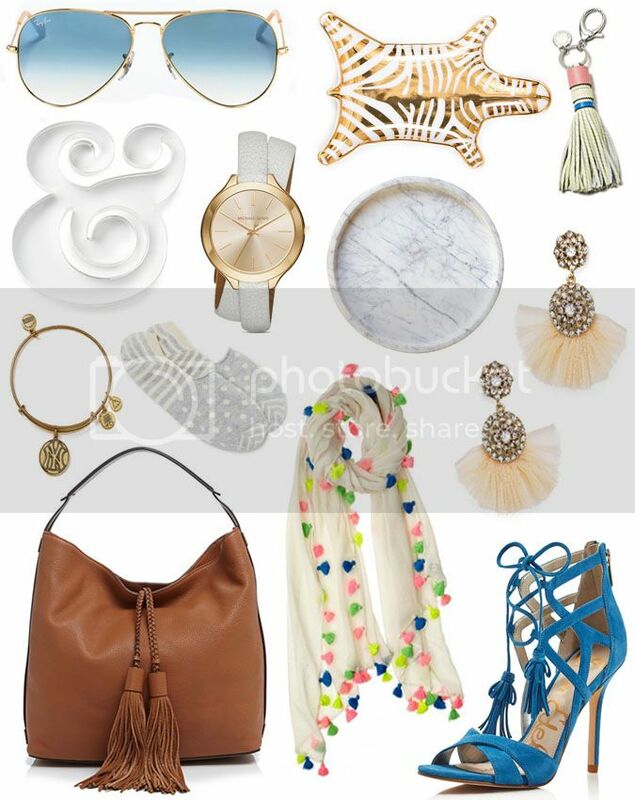 Rebecca Minkoff is all about the tassels and this hobo tassel bag is perfect for spring - I'm loving the white one! These cute tassel keychains are so cute too, they're so great to use as a key chain or to clip onto your bag for an extra little detail. I officially have a new favorite brand of shoes - Sam Edelman has the cutest shoes in such cute colors! I love these tassel detailed heels that come in such cute colors and these gladiator sandals are the perfect shoes for summer. I live in cute sandals all summer long and to my surprise, Sam Edelman's shoes are super comfy too! Having something simple like these polka dotted liner socks may seem strange to have in a Friends and Family roundup, but this is the season of espadrilles, closed sandals and flats; fashion can be painful, but these socks make your shoes much more bearable! I have a ton of these - they have a small gel insert in the heel part so that the shoes don't irritate your heels and they're low cut so that they don't show no matter what kind of shoes you're wearing. I swear by these - they help my feet soo much in espadrilles and Vans! In honor of baseball officially being BACK!, I had to include this cute Alex and Ani bangle. If you know me, you know that I'm the biggest New York Yankee fan. I was fortunate enough to be at Opening Day yesterday and although we lost and it was pretty chilly, it was such a fun day and such an amazing experience - it's a pretty cool feeling to have been to the last game of last season and the first game of this season! It's definitely something I plan on doing every year and sporting the Yankees in any and all ways possible is a must for me! Bloomingdale's home section never fails to amaze me - I often forget that they (and Nordstrom too) have home sections! This has been the biggest hit for me so far with the sale... I mean, to all my fellow bloggers - how great is this marble tray?! You can definitely expect to see it in a LOT of my upcoming blog pictures! ; ) I also love this adorable pineapple bowl for summer. Anything that has a pineapple on it - you can count me in! Oh how I love Bloomingdale's! I would spend all my money there if I could. I need all of this basically. I love the ampersand paperweight! Can I have one of each, please? Loving the tassel hobo bag! Excuse me as I go broke shopping here. Your posts get increasingly dangerous to my wallet girlfriend...haha! The sale looks amazing and I love those blue tassel heels! I love the tassle and the fringe trend too. I've been craving a Rebecca Minkoff bag for so long. And those Sam Edelman shoes are must haves. So many great finds. Great picks! I've been wanting that zebra dish forever! I didn't even know tassle is a trend these days, it totally fits the Spring weather and the summer too. I love the collection above, especially the bag, the watch, and the sunnies! I've already spied several gift ideas. What a great collection. Love the crisp, clean look! I have such a Ray-Ban love! I'm more of a Wayfarer girl myself, but I do love the aviators! Omgosh that gold zebra dish!!! I have been wanting one like that and finally I can avail one. I have been trying to figure out where to get but keep forgetting to look around for it. Thank you for sharing. so so many great picks! I love those tassel heels! I just found out about their friends and family sale so I'm going to be there today picking up a few stuff. That's always been one of my favorite store. Bloomingdales is the best! I love those handbags! I think I need that Yankees bracelet for sure...and everything else here! Oh, I love! I am digging the lace ups and the tassels! I love it all, those boho chic are so pretty. Very nice choices and options. Love all the pieces you have here. The jewelry collection looks really elegant. This is such a great Bloomingdales sale! They had a pair of flats from there that I absolutely loved. That marble plate you picked is amazing! Oh man, I want ALL of this stuff. I love all the fun tassel items like the scarf! This is all adorable! Jacob Time is selling authentic brand watches, with authentic watches selling at a MAJOR discount.